Everything is always a work in progress. I’ve written before about the Russian fantasist Sigizmund Krzhizhanovsky. Due to Soviet censorship, he went unpublished in his lifetime only to be rediscovered and translated in the new century. He took his place among my favorite writers on the basis of Memories of the Future and The Letter Killers Club. Autobiography of a Corpse and the latest release, The Return of Munchausen, are slightly lesser works but still good. Munchausen, for the uninitiated, is a fictional character loosely based on an actual German aristocrat. He’s a serial exaggerator. He rides cannonballs, vacations on the moon, and pulls himself out of swamps by his own hair–or claims to. Krzhizhanovsky’s Munchausen isn’t just a teller of tall tales, but a defender of fiction, an advocate for fantasy: “I flatter myself with the hope that I have made better and wider use than other barons of my right to flights of fancy.” His motto is “truth in lies.” He has a “theory of improbability”: where probability theory studies things that happen many times, improbability theory studies things that have happened less than once. A scholar protests that Munchausen’s theory is all metaphor, but that’s the point: “People are fractions passing themselves off as ones… and the acts of a fraction are all fractional,” he argues. Probability alone isn’t a reliable guide to anything as unpredictably irrational as human beings. So when Munchausen is asked to tour and report on the new Soviet Union, he returns with a lecture full of the usual impossible adventures. Here we see why Krzhizhanovsky had no luck getting published. The Russian sequence is a long, caustic vent about Krzhizhanovsky’s every frustration with his country. Secret police and famines get a look in, but Krzhizhanovsky aims most of his satire at the government’s control of ideas and its treatment of artists and intellectuals–understandably, maybe, in Krzhizhanovsky’s circumstances. Trains are fueled by burning books; Munchausen’s train crawls by inches because the engineer is an ex-professor who keeps stopping to read. Munchausen can see Soviet science is advancing because the scientists, lacking blackboards, are running after the trucks on which they’ve scrawled their equations. For modern readers some of Krzhizhanovsky’s less broad and more specific jokes are obscure enough to warrant endnotes: at one point Munchausen is sentenced to a “conditional execution,” which the notes tell us was a real punishment handed down on one occasion to an engineer whose skills the government couldn’t actually afford to lose. But even without the context there’s still plenty of wit here. 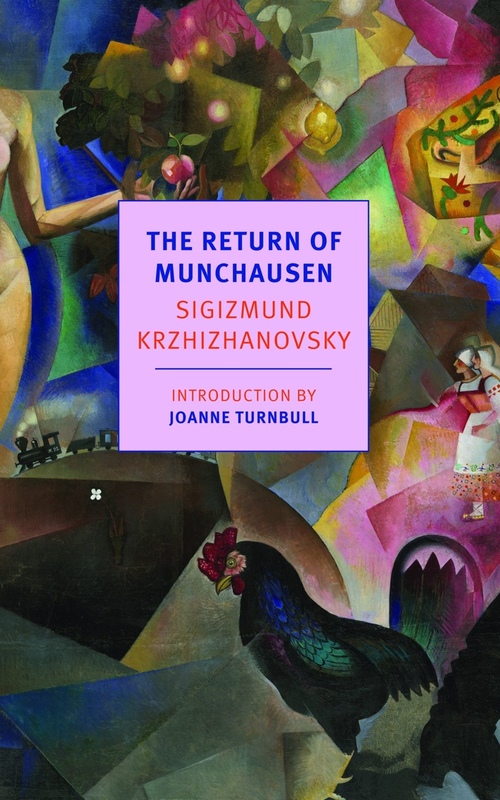 Krzhizhanovsky knows this is satire but Munchausen doesn’t share his latest author’s awareness: he thinks he’s created a flight of fancy, unmoored from reality. When he learns his lecture was nothing more than a comic exaggeration of the truth, Munchausen is stricken. Munchausen is an intellectual anarchist. For him, tall tales represent freedom; absurdity opens up new imaginative possibilities. So it’s important to Munchausen that his tall tales actually are absurd–that they put some distance between themselves and the reality they depart from. If the world isn’t reasonable, Munchausen’s refusal to conform to reason is nothing special. Now reality itself is absurd enough to overtake Munchausen’s ability to reimagine it, and the jokes don’t seem so Pythonesquely anarchic anymore. Just bitter. The posts about novels (or movies, or other media) aren't reviews or recommendations so much as attempts to work out my thoughts. Some of them discuss the parts of the novel that are supposed to surprise you the first time you read it. Putting a spoiler warning in every post would get boring quickly, so I'm sticking it here in the sidebar. These pages are © 2016 M. Wesley Osam. No material may be used without permission, although would anyone really want to?